Represent your certification and achievement with Postgres. Include your badge on all of your online profiles. Earn an industry-recognized credential that helps prove your skill level, provide distinction, and can get you hired. Display your EDB Postgres Certified badge, highlight your achievement and get noticed. Validate your skills and join an elite group of Certified professionals. Accelerate you professional development and help enhance your credibility and career success. Your digital badge is one more way that EDB supports the development and recognition of your professional skills. Take advantage of this program to validate your technical expertise, and to help advance your potential. Complete the criteria for earning a badge, and add an EDB Postgres Certification Digital Badge to your Linkedin profile, Facebook page, or Twitter account, to confirm you Postgres professional and technical expertise. Display your hard work and accomplishments. Each badge gives details about specific skills you developed and what you did specifically to earn the badge. Badges are a digital representation of your certification achievements with Postgres. To earn a specific badge, you need to complete the required pre-requisites and score a passing grade on the certification exam. You can get started preparing to earn your first badge right away by taking FREE Postgres Training from EDB. The Essentials class meets the pre-requisite training for the Associate-level EDB Postgres badge. A badge is a digital way to represent your certification achievement and are web-enabled versions of a credential, certification or learning outcome, which can be verified in real-time, online. Open badges refer specifically to badges that adhere to an open standard being led by Mozilla for recognizing and validating learning. View all EDB Postgres badges and requirements for earning them on the profile page. 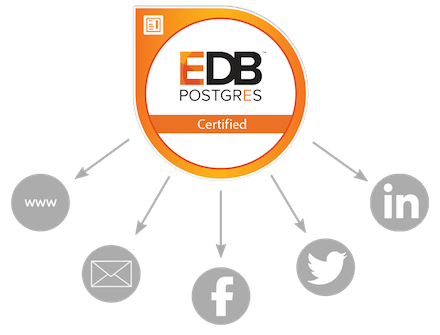 Badges are digital representations of your Postgres certifications earned by passing exams provided by EDB. Your digital badge is made of an image and metadata uniquely linked to you. This ensures that only you can take credit for your specific achievement. You can share your digital badge to multiple social platforms including LinkedIn, Facebook, Twitter, and WhatsApp. It can also be embedded in a resume, your personal website, or an email signature. Your EDB Certified status can also be added to your Postgres Rocks community profile, identifying you as a member with distinguished experience. Anyone who completes the pre-requisites for certification from EDB Postgres and achieves a passing score on a certification exam is eligible for a badge. See the next section below for information on receiving and using your badge. Share your badge to LinkedIn, Facebook, Twitter, and WhatsApp. Explore labor market insights and job opportunities. ​What is required to Pass the Certification Exam? Most exams have pre-requisite training courses and are rigorous, so hands-on experience and experience in the field is recommended. You can get started preparing to earn your first Associate badge right away by taking the Free Postgres Training from EDB. Be sure to take advantage of the demos and lab exercises provided by EDB Training. Individuals at EDB Partner organizations who have successfully passed any of our certification exams, version 9.3 or higher, will be issued digital badges and will receive e-mail notifications from Acclaim with information on how to accept them. We are also in the process of developing special badge identifiers for EDB Certified Instructors and Certified Partners. Anyone who views your badge can select it to learn more about your skills and to verify its authenticity. EDB certification credentials are recognized, respected and valued globally in the industry, and sharing your badge enables you to communicate your achievements publicly and stand out. Acclaim is a product of Pearson, the world's leading learning company. Acclaim is an enterprise-class badging platform that uses the Open Badges standards for sharing and communicating learning achievements through digital version of your credentials. Your achievements and credentials from many different technologies, academic institutions, and professional organizations can be shared through Acclaim.